ErieCPR at the #ErieViaduct / Tuesday, Sept. 21, 11:30am / RAIN or SHINE — Why Save the Viaduct? To Keep Kids Safe. 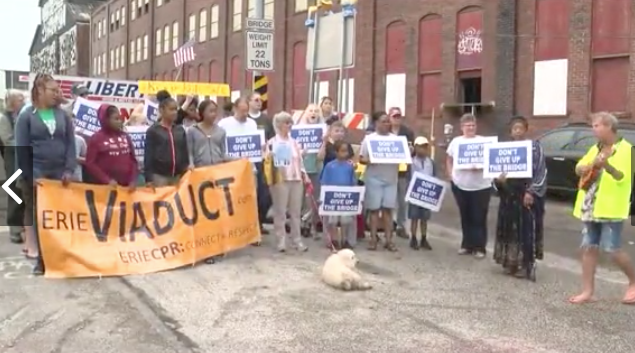 Aug. 22, Erie, PA The grassroots group, ErieCPR:connect+respect (legally affiliated with the Erie 501c3, Winds of Change) is hosting a brief press event with ErieCPR officers on Tuesday, August 21 at 11:30am at the north end of the McBride Viaduct (East 12th St. & East Ave.) to review the ErieCPR Complaint filed in Federal Court, and to discuss the “Bridge the Gap” fundraiser on September 7th at the Sunset Inn. Older PostSept. 7th Viaduct Fundraiser Announced!